You’ve reviewed the application instructions and our Frequently Asked Questions to confirm the product has been applied as suggested. You’ve submitted a customer service inquiry via the Contact Us page or called our Customer Service line to discuss how to improve your results. Login to your account via the My Account link in the top menu and print the Order containing the product to be returned and refunded. Close the twist top and seal the cap on the product as appropriate. Place the product in a sealed plastic storage bag. Include the product and a copy of your order confirmation email in your shipping container (client responsible for shipping charges). We suggest using a box similar to the one in which your product was received. When we receive and process your return we’ll issue a refund using the method in which we received payment for the order. 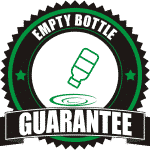 That’s our Empty Bottle GUARANTEE, making your 1st use of our products a “No-Brainer”! P.S. Please let us know if there’s something we can do to make things right by completing the Contact Us form and sharing the details of your situation.